Curbside recyclable pickup is provided on a bi-weekly basis to all township residents* by Republic Services. The recyclables are picked up on the same day as the trash, but with a separate truck. For this reason please do not place the recyclable materials next to the trash, this will ensure that the appropriate truck will collect the recyclables and trash. 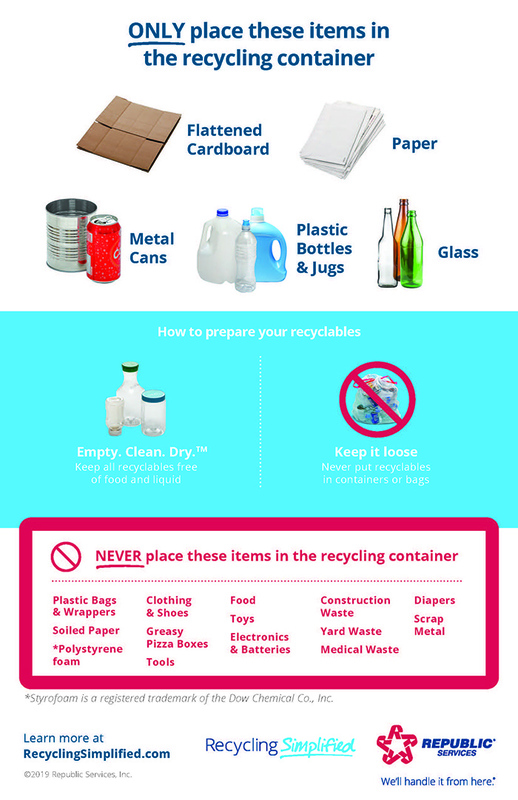 Place recycling out the night before your scheduled pick-up day. Collections begin at 5:00 am. If your recycling is not out when the service personnel arrive, the pick-up will be missed and will not be made up until the next collection cycle (two weeks later). *Note: Hunters Crossing development and Lake Cushetunk Townhouse, Condominium and Apartments are not part of the Township contract, continue to follow whatever schedule your management association has set up. Should you have any questions regarding the trash or recycling collections, please call Republic Services customer service department at 908-730-7800 during office hours Monday through Friday, 8:00 am to 4:30 pm.